I firmly believe that Yoga is for everyone and I have taken it as my mission to prove that to as many people as possible. Have you ever felt lost and out of place in a Yoga class? Maybe you concluded this is just not for you… and never came back. I found that it’s partially because there’s a lot of teachers out there are good yogis but they do not teach, they have others follow them. Being a good Yogi doesn’t make a good teacher. That’s what pushed me to become a Yoga teacher, to be a good one and bring Yoga and its benefits to as many people at possible. You can find me in Singapore. – Post natal classes and mums & babies are organised ad-hoc. Kids Yoga weekly classes are organised as private groups. To check availability in a group or to form a new one please contact me. – Private individual or couple classes ar available on demand. Timings depend on availability. Please contact me to schedule. Actually, what is Yoga? – Yoga is an ancient philosophy to live a healthier and happier life. It includes postures, gestures, breathing techniques, relaxation and a certain change of mindset too. When you put your focus (your mind), your breath (your energy) and your body into something, the effect is much stronger than simple exercise and it has a profound effect in your entire being. What level do you teach? – Mostly beginners and intermediate. I adjust my classes to the level of the students, giving props and variations for everybody to work at their pace. You will never feel out of place in my class. I believe that every posture can be adapted to the student with the guidance of the teacher. This is the philosophy of BKS Iyengar and the principle I apply in my classes so that my sessions are as inclusive as possible. Where do you teach? – Cliveden @ Grange Rd function room and my Sparrowebites Home Studio in Tanglin Park. Meditation workshops are @ Balanced Living, and private group classes could be scheduled there too. What kind of yoga do you teach? 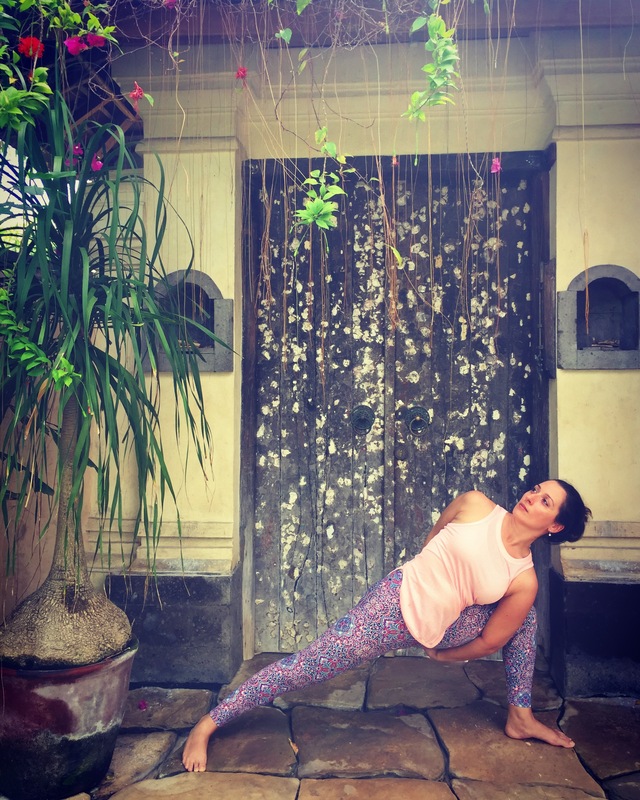 – I got trained as a teacher in Hatha but I myself mostly practice Vinyasa and Kundalini Yoga. Therefore my classes area mix of both. I call it Masala Yoga. I add bits and pieces from everything I learnt through the years and found useful. My classes are NEVER the same sequence. I like a relaxed atmosphere, my class is not a strict discipline. It will challenge you, but there’s always space for sense of humour. Life is too short to be serious all the time! Do I need to have specific kind of body to do Yoga? Oh dear, Instagram has done a lot of damage. You absolutely don’t. You don’t need to be super fit, bendy or be able to touch your toes. You don’t have to be a gymnast, an athlete, or an acrobat from Cirque Du Soleil. I celebrate diversity and inclusion. You just need one thing: to want to do Yoga. Buddha said: ‘When the student is ready the teacher will appear’ – If you made it this far maybe It’s because you have reached that point. Maybe It’s time try a different type of Yoga class. Do I need to be able to do advanced postures? The purpose of Yoga is not to be able to perform certain postures. The advanced Yoga postures we tend to see people showcase, particularly on social media, are made for those that already don’t feel anything in the simpler versions. Or for those who want to go on a journey of dedicated practice to achieve them. It’s not the aim of Yoga to be able to perform them. BOOM! Myth busted! It’s a very rewarding experience to be able to achieve them, and of course one should be proud and show the world your achievements, but getting there is not the aim of Yoga. Don’t get misled. Check out SERVICES section, or CONTACT to get a trial class. Have a look at TEACHER CREDENTIALS and my philosophy if you want to know more.